Houdini requires a product activation via internet. 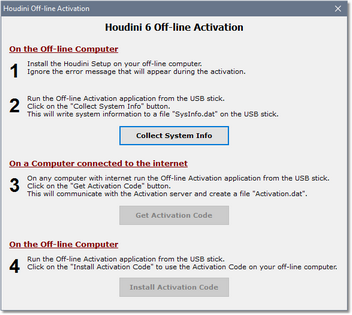 If you want to install Houdini on a computer without internet access, you can use the Off-line Activation module. You will require any other computer with internet access, and a USB memory stick to transport files to and from the off-line computer. The process boils down to clicking 3 times on a button on the two computers and shouldn't take more than a couple of minutes. Note that NOTHING will be installed or modified on the computer with the internet access, it is only used to perform the communication with the activation server. The activation data is saved on the USB stick in two binary data files. Instead of a USB stick you can also use a shared network drive. Below a step-by-step manual to perform the installation of Houdini on a computer without internet access. Download the Houdini Setup and copy to the USB memory stick (or shared network drive). Download the Off-line Activation Module and copy to the USB memory stick. Write down your Customer Code and Serial Number, or copy the values to a text file on your USB stick. Run the Houdini Setup from the USB memory stick. Enter your Customer Code and Serial Number when requested. During production activation you'll get the error "Product Activation Failed" because of the missing internet connection, you can simply ignore it. Run the Off-line Activation Module from the USB memory stick. Click on the "Collect System Info" button. A "SysInfo.dat" file will be written to the USB memory stick. Click on the "Get Activation Code" button. The Activation Server will be contacted, and a "Activation.dat" file will be written to the USB memory stick. Click on the "Install Activation Code" button. The Activation code will be registered and the Houdini engine files will be updated.